Hi there, my darlings! Remember my last meetup with Joanne of Daphine Polish, when she handed me a ginormous bag of goodies to review? 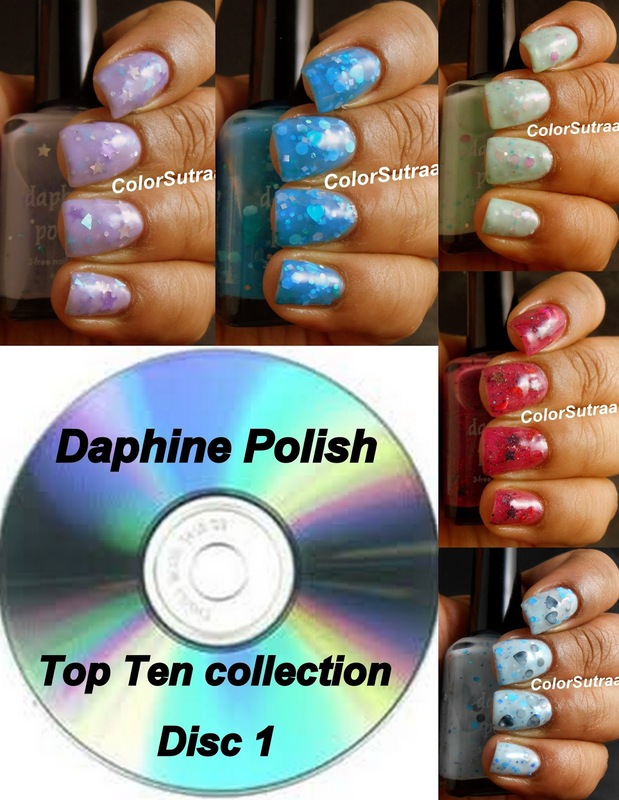 Well, it's that time to show you the contents of that goodie bag--the Daphine Polish Top Ten collection for Spring 2014! Inspired by some of Joanne's favorite bands and musicians, this collection of jellies and crellies packed full of glitter contains a whopping ten polishes, split into 2 halves. The first set of 5 comprise Disc 1 and the second set comprises Disc 2--totally cute, right? "Inspired by the Warren Zevon song from his album Life'll Kill Ya", first up, I have for you A Fistful of Rain--a minty green crelly full of violet, turquoise, silver, and matte gray glitters in various shapes and sizes including violet holographic circles. Both the application and formula on this polish was loevly and the swatches below show 3 coats on its own, topped with 2 generous coats of G&G's HK Girl to finish the look. Although I'm usually not a fan of greens, this was one my faves from the collection--I love rain and this reminded me of a fresh April shower! Inspired by the Better Than Ezra song from their album How Does Your Garden Grow, the next polish is At the Stars--a lavender crelly packed full of silver hex and holographic stars, turquoise holo shreds and small matte purple stars with a touch of added blue shimmer. Again, no issues at all with formula or application--I was in fact pleasantly surprised with how well the shards, which inevitably tend to clump together, applied! The swatches below 3 coats on its own, topped with 1 generous coat of G&G's HK Girl to bring it all together. 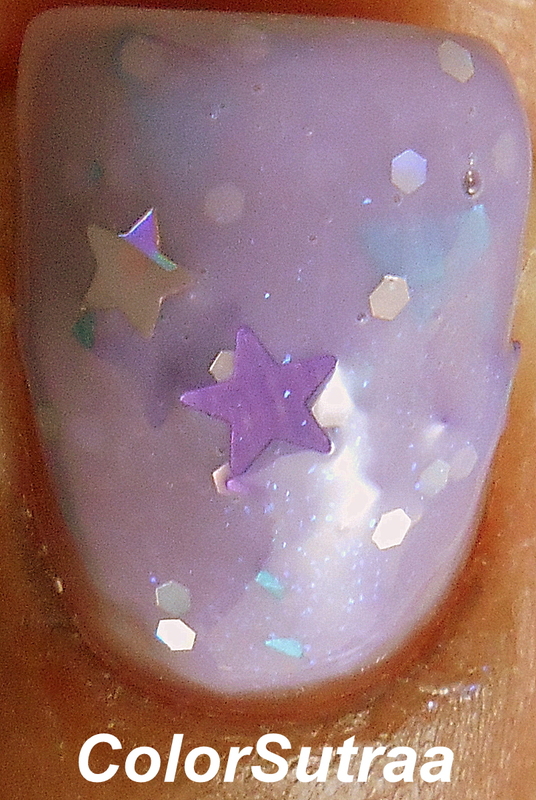 I love this shade of purple and the teeny, tiny stars! teeny, tiny holographic hexes in red and black. Both the application and formula on this polish was fantastic--not too thick, not too thin and I barely had to fish for the glitters. The swatches below 3 coats on its own, topped with 1 generous coat of G&G's HK Girl. 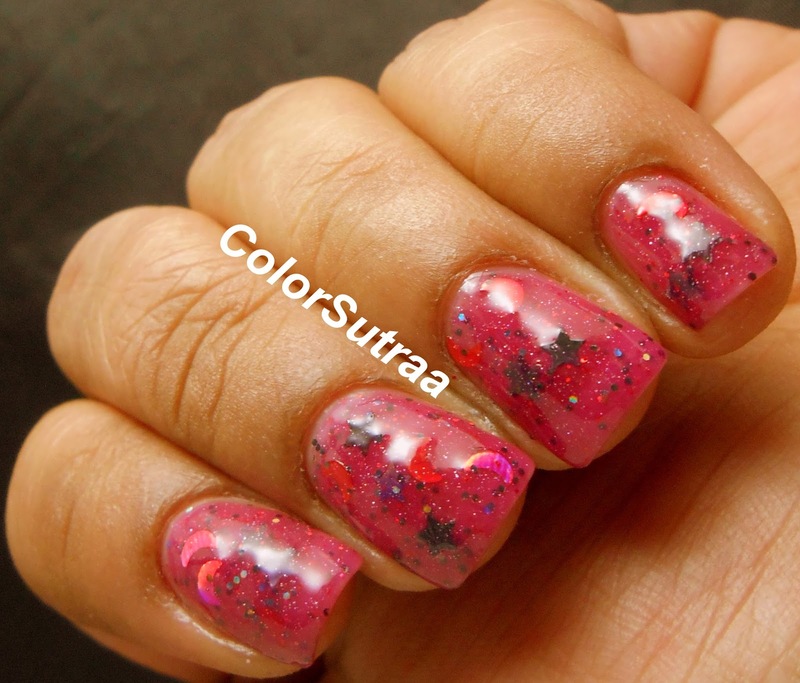 LOVE the holo moons in this! "Inspired by the Michele Branch song from her album The Spirit Room", my personal favorite of this set is Drop in the Ocean--a gorgeous aqua blue jelly packed full of blue, turquoise, and silver holographic hexes and squares, light green matte circles, and turquoise hearts. Again, no complaints with the formula or application and the swatches show 3 coats on its own, topped with 1 generous coat of G&G's HK Girl. I loved this SO much I really didn't want to take this off! SO gorgeous! Last but definitely not the least, "inspired by the Sister Hazel song from the album Absolutely", I have for you Little Black Heart--a blue-tinted gray crelly with black circles and hearts along with silver and blue hexes, squares and circles. I was really impressed with the formula of this one--the larger hearts popped right out and made application a breeze. The swatches show 3 coats on its own, topped with 1 generous coat of G&G's HK Girl to finish the look. So there you have it! Disc 1 of Daphine Polish's Top Ten collection for Spring 2014! 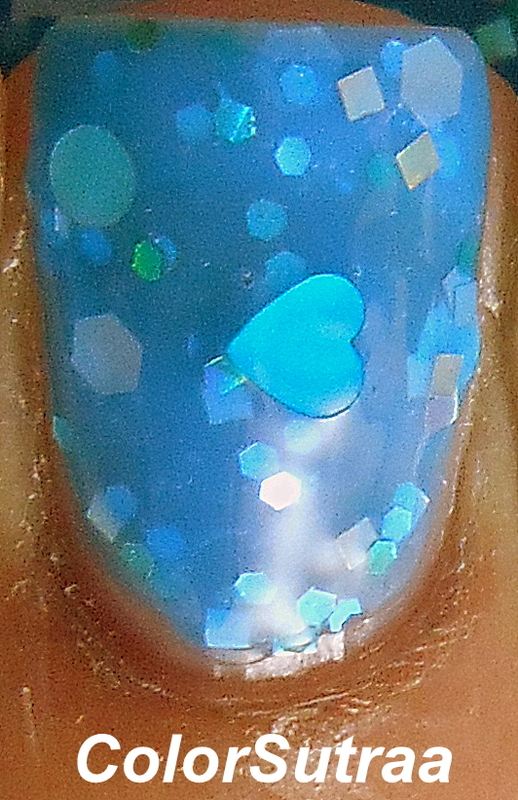 You can find these pretties at Daphine Polish's Etsy shop HERE, for the price of $10 for a full-size, 0.5 oz bottle. Remember to follow Daphine Polish on FACEBOOK and on INSTAGRAM for all the latest updates and sneak peeks! Stay tuned for Disc 2 of this collection! Oh, wow. These look so much different than I expected!